Erich Weiss was this nation's and perhaps, the world's, greatest illusionist. Appearing under the stage name of Harry Houdini, he studied the history of magic and then perfected many innovative tricks. He won a great following in the United States and Europe in the second and third decades of the Twentieth Century. It may not be an overstatement to aver that he was the most accomplished magician to ever walk on the earth. Erich Weiss grew up in modest circumstances on the upper East Side of Manhattan. In addition to his intensive study of the evolution of magic, he devoted great efforts to building his own body strength through working out, swimming and other exercises. He developed exceptionally strong abdominal muscles. In many of his performances, he would ask the strongest man in the audience to come up on stage, and hit him in the solar plexus as hard as possible. Strong men rushed to the stage, Houdini flexed his stomach muscles and stood without flinching as boxers and other athletes hit him. They went away with sore knuckles, while Houdini hardly moved an eyebrow. On Tuesday evening, October 16, 1926, Houdini gave a performance at the Princess Theater in Montreal. After the show, a young McGill student, J. Gordon Whitehead, visited Erich Weiss in his dressing room. Whitehead asked Houdini if it was true that he could take any punch to the stomach. Houdini was engaged in a conversation but seemed to answer Whitehead's inquiry in the affirmative. Harry Houdini did not have time to flex his abdominal muscles before Whitehead hit him three times. Houdini was on a tour of many cities and continued his performances even though he began to experience severe stomach pains after Whitehead's surprising attack. Houdini was scheduled for a performance in Detroit on Saturday evening October 30 at the Garrick Theater which adjoins the Lafayette Building on Michigan Avenue just across the street from the Book-Cadillac Hotel. Houdini felt terrible so he asked his agent to have a doctor meet him after his Saturday evening performance. Being a dedicated thespian who internalized the principle that the show must go own despite the serious pains of the actors, Weiss gave his Saturday evening performance at the Garrick despite a temperature of 104 degrees. A doctor met him immediately after the performance, recognized serious symptoms and admitted him to Grace Hospital. On Sunday afternoon, October 31, 1926, Erich Weiss died at 1:26 PM in Room 401, Corridor D of the John R. Wing of Grace Hospital. His body was taken to the W. R. Hamilton and Company Funeral Home at 3975 Cass. There was no public viewing of his body. Just a couple of weeks earlier, Weiss had order a massive new coffin for use on the stage. He expressed a desire to be buried in this prop. The lining for the coffin was sewed in Detroit the day of his final performance. Apparently, the Hamilton Funeral Home placed his body in the coffin, but then later removed it. There was no public viewing of his corpse and the coffin remained in Detroit. On Monday evening November 1, 1926, the New York Central Railroad added a special car to their Detroiter train to carry Houdini's remains back to his home town. Only his wife and his brothers accompanied his bier. There is debate about what killed Houdini. Perhaps he died of peridentinitis that developed after the punches. Perhaps he died of appendicitis that was triggered by his internal injuries. Mr. Whitehead was not prosecuted in Quebec. Apparently he became a theological student and then disappeared. The Hamilton Funeral Home was established in the 1870s and became popular with the survivors of some of the city's most impressive decedents. In 1916, this funeral home purchased the Robert and Jennie Brown Home on Cass. The boom in Detroit in the 1920s attributable to the automobile industry meant the funeral home was turning sod frequently. In the mid-1920s, they decided to build the Art Deco building you see fronting Cass to serve as a mortuary chapel. Interestingly enough, they decided to embellish the building with North African décor. Note the graceful arches that might be seen as Moorish if you imagination is strong. Toward the top you see an Egyptian Revival Style of decoration. The Robert and Jennie Brown home is a great Detroit example of the eclectic and almost puzzling diverse Queen Anne Revival style. Why the Hamilton Funeral people decided to build an Art Deco chapel contiguous with the home is puzzling. Nevertheless, the Hamilton Funeral Home is a marvelous example of Art Deco architecture with Egyptian motifs. 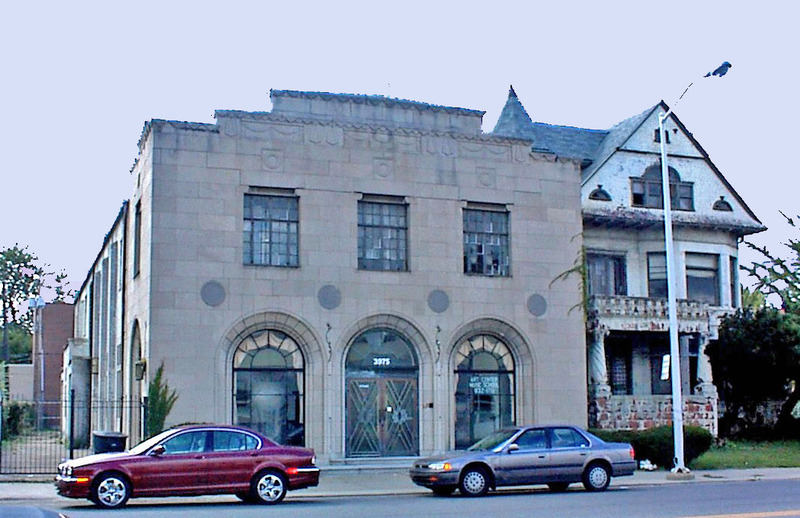 I believe that the Art Deco mortuary building was completed in 1930, meaning that Erich Weiss' body laid briefly in the Robert and Jennie Brown Home. These structures were sold in 1979 to Synanon, the California drug treatment program. Synanon did not win the zoning variance needed to open a treatment center here, so in 1981, the buildings were sold to the Art Center Music School, Detroit oldest such school dating from 1922. Biographies of Erich Weiss: Houdini The Career of Ehrich Weiss: American Self-Liberator; Europe's Eclipsing Sensation, World's Handcuff King and Prison Breaker, by Kenneth Silverman: Harper, Collins; 1996. Hiding the Elephant: How Magicians Invented the Impossible and Learned to Disappear, by Jim Steinmeyer; Carroll and Graf, 2003. Brown Queen Anne style home completed in 1891.